There are currently numerous organisations and projects collecting supplies and funds to support refugees. 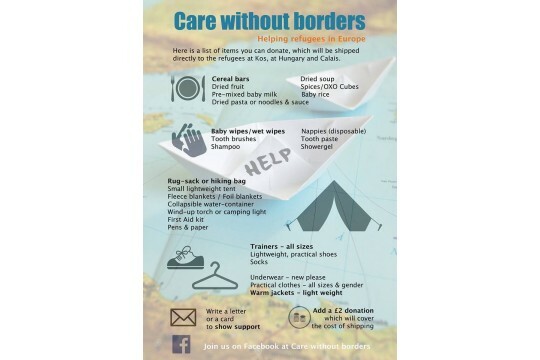 Our recommendation is to support Care Without Borders, a local project set up to distribute aid directly to refugees in Calais and Hungary. They are accepting donations of supplies which they ship directly to refugees. They are also fundraising to cover the cost of shipping and travelling to refugee camps. You can make a cash donation using our Local Giving Appeal. You may also be interested in supporting an alternative refugee project, depending on the resources that you currently have available. Below is a list of some of the different projects that we have found to provide you with some ideas of different donations that you can make depending on your resources and preferences etc. If you have any unwanted musical instruments you could donate them to Music Against Borders. They are planning to travel to Calais on the 20 th October 2015 to take the donated instruments to refugees. They are also planning on recording some music sessions with refugees. You can either drop off your unwanted instruments at a drop off point, send it by courier or set up your own local drop off point. If you have any unwanted books you could donate them to The Jungle Library. This is a small project in London set up to donate books to a library for refugees living in the Calais camp. “Many people here are well-educated — they want to get on and they want books that will help them read and write English, apply for jobs, fill-in forms.” They are particularly in need of translation dictionaries. You could donate funds to Doctors Without Borders. They are an independent worldwide project providing medical attention to victims of war and natural disasters etc. You can find out extensive information about their current and past projects on the Doctors Without Borders website. How about making a donation to a project such as ‘Childhood bags’. This project was set up by a mother and daughter, a retired teacher and lecturer. Their fundraising project was set up to put together ‘childhood bags’ which will have books, toys, a warm jumper and socks for winter. They raised over £25,000 through Crowdfunding on 12 September 2015. You could donate funds to a similar project or donate items to this project to fill the bags for children. Tickets are £20 and include a two course meal and coffee. There will be both meat and vegetarian options available. We will be donating 50% of raised funds to Care Without Borders. You can find alternative projects on Facebook, Local Giving, Crowdfunding and other similar websites.